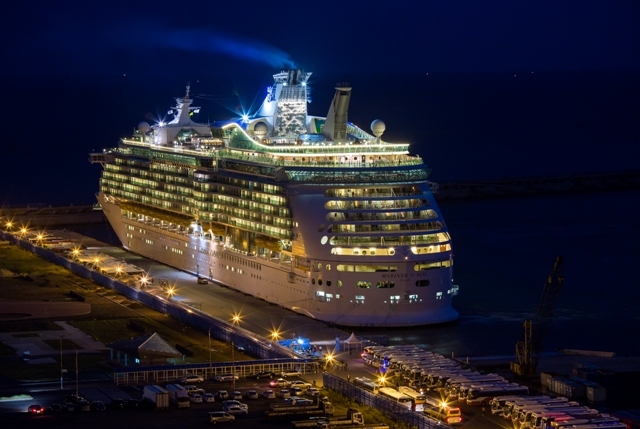 Plans are being executed to make cruise tourism a central pillar of Jeju’s economy for years to come. A dual civil and military base and tourism port will be built by 2015 at Jeju Outer Port and extra berths for the simultaneous docking of two 150 thousand ton ships will be constructed. In addition, in the area around Jeju Outer Port and Sanjicheon, the historic area of Jeju City, Tamna Culture Plaza will be constructed by 2015. It will be a public space for residents and tourists to experience local culture, festivals, food and shopping. The development will cost 12.8 billion won, with 6.4 billion supported by government and 6.4 billion privately invested. Work has been ongoing since July at the west seawall of Jeju Outer Port. Much of the site has been fumigated and nine mobile passenger stairways have been installed. Work is also ongoing on a large security fence. The upgrading of the passenger terminal is crucial to achieving this vision. A two-floor international terminal with a waiting room, lounge and duty free shop will be constructed in the Outer Port site of 48,237㎡ by 2015. The inclusion of Tamna-themed tourism at Tamna Culture Plaza will allow international and domestic cruise tourists to see, feel, and enjoy the story of Jeju Island. This will ensure an economic boon to local tourism through the preservation of local culture and creating a new tourist space. If the developments continue at the current pace, Jeju is set to achieve its ambition of being the regional hub for cruise tourism by 2015.